We can be the media. We can be the publisher. Today, brands can be their own media engines and aspire to be self-publishing machines. Of course having third-party validation is still smart and necessary – in fact, global trust in earned media is above 50 percent – but now you can complement earned media, and boost lead generation and brand awareness through your own engine (with your exact messaging, if I might add). Enticing? Should be! We are more in control of our brand messaging than ever before. And if you can’t take my word for it, here it is — by the numbers. 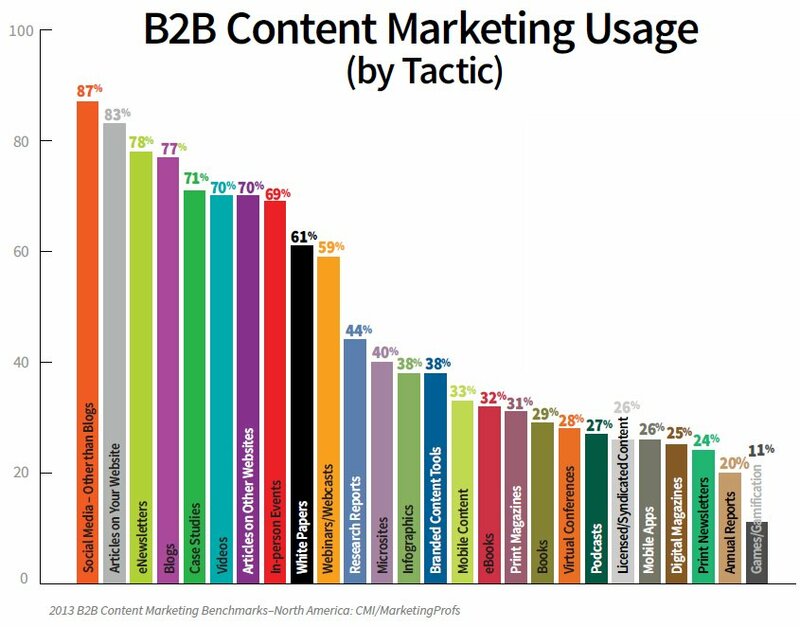 The Content Marketing Institute and MarketingProfs churned out another excellent survey in which 1,400+ B2B marketers responded from North America in (Aug 2012). Regarding content marketing tactics, nearly 90% of respondents selected social media — now the most popular media engine. 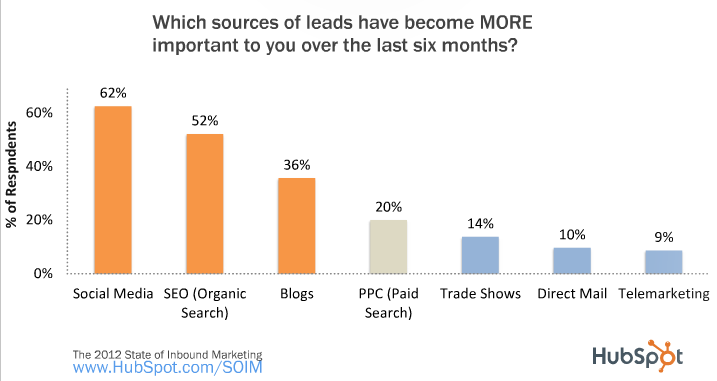 HubSpot also surveyed nearly 1000 marketing professionals and found that 62% of respondents selected social media as the source of leads that has become more important to them. The term “convergence” comes to mind again. Because PR professionals work tirelessly to promote a brand’s products and services and to build solid thought leadership platforms, the role of public relations is being redefined to also encompass owned media — both content and social media marketing (some might call it Inbound PR ). Once you look into the ROI potential and make the decision to move forward with content and social, the next challenge will quickly become choosing the right content tactics and social media channels for your company. The above/below findings will help guide you in the right direction. 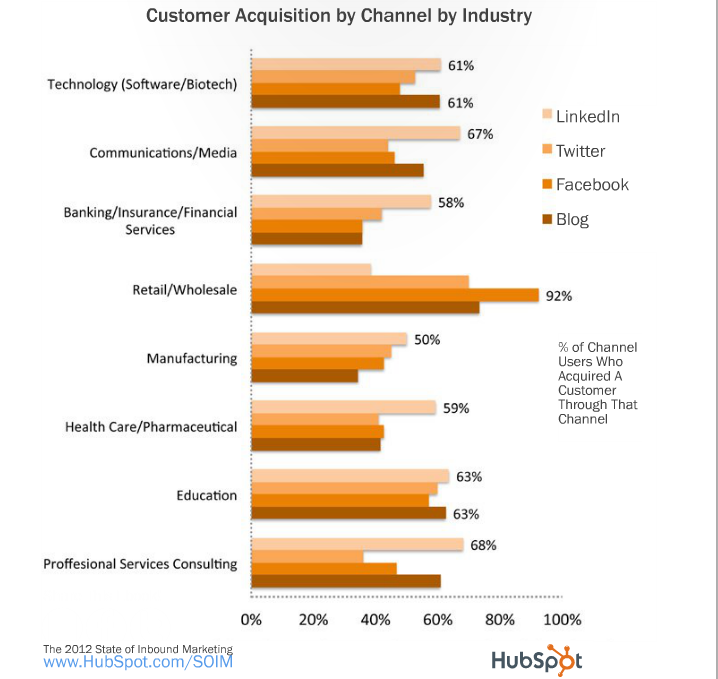 For B2B marketers, LinkedIn, Twitter, and blogging have proven most effective for customer acquisition. 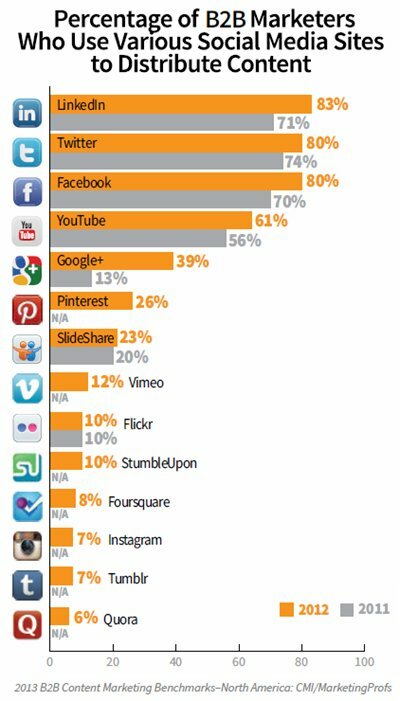 According to the B2B Content Marketing survey, B2B marketers use an average of 5 social media sites to distribute content. For B2C marketers, Facebook, blogging and mobile content/apps have been overwhelmingly valuable. Here’s a more detailed break down by industry. Here are links to all the survey findings — well worth the read! I want to send a big THANK YOU to the Content Marketing Institute, MarketingProfs and HubSpot for continuing to provide the marketing community with such useful insights into what’s new, and more importantly, what’s working.